In line with the continuous efforts to develop attractive and ground-breaking products and services to customers, Stena Line has installed Japanese sleeping pods on its Mecklenburg-Vorpommern and Skåne vessels, operating between Rostock in Germany and Trelleborg in Sweden. “We see it as an innovative offer for a cost-conscious target group, which nonetheless values comfort and privacy,” said Martin Wahl, Stena Line’s Travel Commercial Manager for Stena Lines routes between Germany and Sweden. 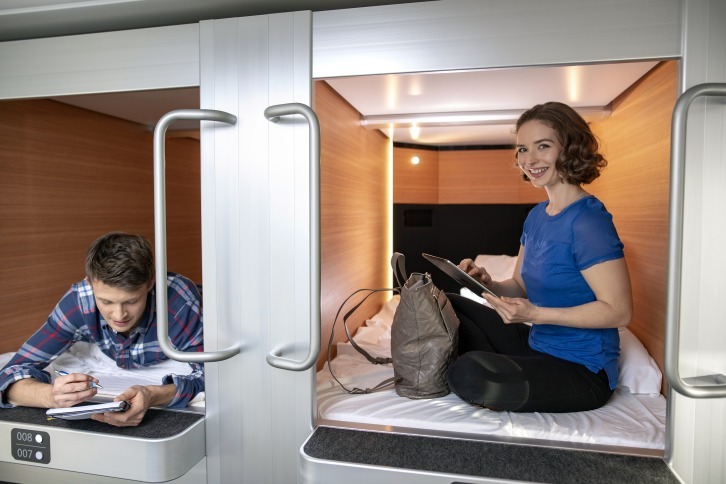 Each berth is equipped with a mattress and bed linen, as well as air conditioning, charging station and WiFi – and luggage can be stored outside the pods in lockers. "The sleeping pods are a great way for young people, backpackers or campers to travel cheaply and comfortably to Sweden. But also travellers on short break and business travellers can fully recover with this modern way of traveling,” says Martin Wahl. The journey from Rostock to Trelleborg takes 6 or 7 hours depending on the departure and is one of the most popular routes between Germany and Sweden, especially during the summer months.